Well I could not resist spilling the beans over on Tetrapod Zoology where Darren Naish has a piece up on plesiosaurs. 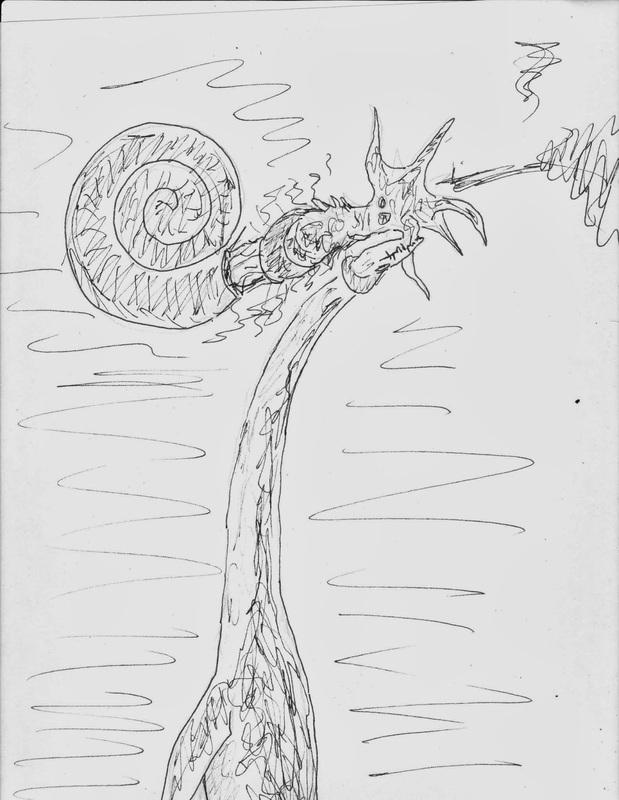 This piece is part of a larger, almost collective unconscious thing going on in the paleoblogosphere concerning all things oceanic, piscivorous, fishy, salty, smelly, filter feeding, teuthophagy, and flippery going on at all kinds of blogs, including mine. Yes a salt spray is in the air and it is splattering everywhere. 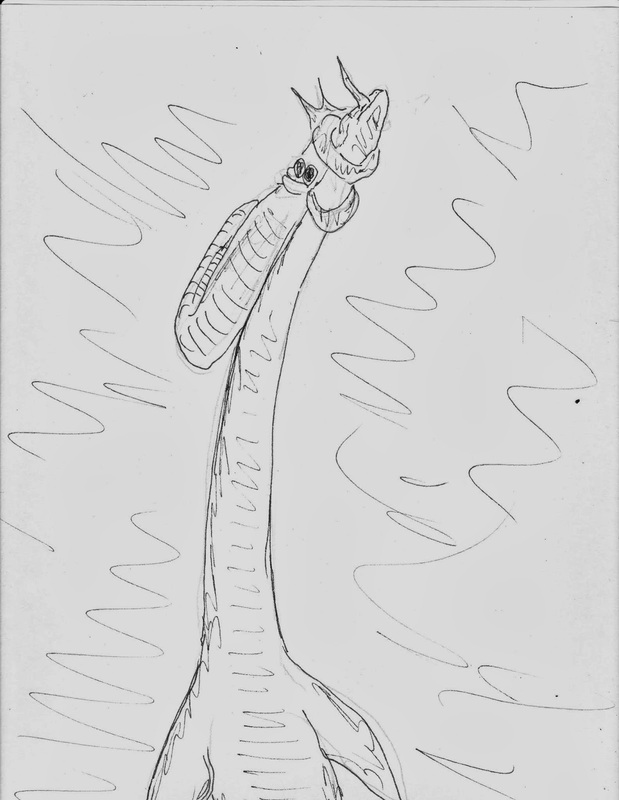 I have developed a hypothesis on plesiosauromorph feeding ecology. Yes, another wacky internet theory on long necked plesiosaurs. I know that a blog on the interwebz is not considered standard protocol in science but, well things are changing and the pace of discovery, spread of news and discourse is going up and since I already sort of said it over at Tet Zoo as well as hinting at it here I might as well put it up here as well. I am working on a paper (my first ever) that can hopefully get published and enter the literature. Because I have put it out on such visible mediums as Tet Zoo comments section and over here I do not think anyone will attempt to get the scoop on me, lest they want the scorn of academic dishonesty. But if you like what I am saying and want to help or have some pertinent papers shoot me a line in comments. But I have my work cut out for me. I think the chief impetus in plesiosauromorph morphological evolution was predation on ammonites. Ammonites were abundant, diverse, and widespread through out the Mesozoic. We should expect that predators as long lasting and abundant as plesiosauromorphs would seek to exploit them. While small ammonites could have been swallowed whole or crunched up and further ground up with gastroliths I think large ammonites were predated upon as well. Plesiosauromorphs would have attacked these large ammonites not by crunching through the shell as pliosauromorphs and mosasaurids did but through a unique method of rotational feeding. 1) Attacking from below in a slow stealthy approach the plesiosauromorph would grab any exposed fleshy part of the ammonite before it could recoil into shell or jet away. 2) After the mouth established a good anchoring bite the plesiosauromorph would then roll it's neck into and against the ammonite shell and begin a series of death rolls. 3) The ammonite shell, being a buoyancy device, would maintain an upright position even as this occurred. 4) By leveraging against the shell of the ammonite and continuing to roll against it the plesiosaur would be able to ratchet the cephalopod out of it's shell. Keep in mind the brunt of the force is not on the small head- that is simply the anchoring point. It is the massive neck that takes and distributes the torque until the ammonite is pulled out of it's shell. 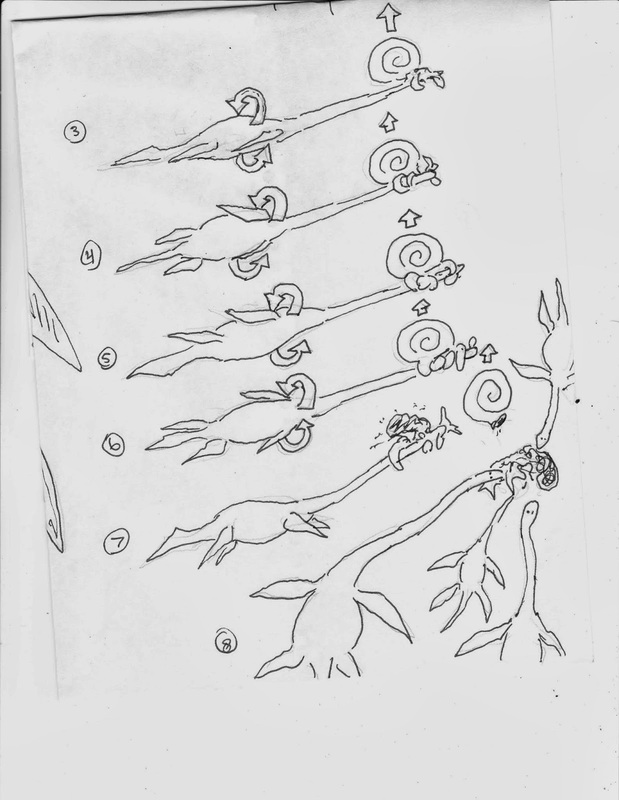 5) After the cephalopod is pulled out the plesiosaur could use rotational feeding to pull off bits to be swallowed or, if living in groups, pull it apart together. Furthermore I do not think it a coincidence that Cenozoic oceans lack abundant shelled pelagic prey and also lack predators similar in design to long necked plesiosaurs. 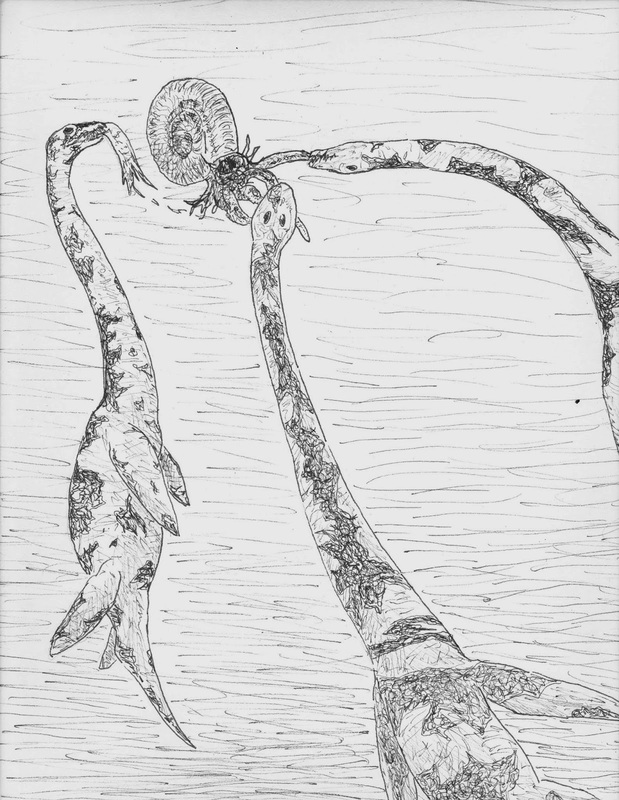 The largest and most long necked plesiosaurs, the Elasmosaurids, were coincident with the largest ammonites during the Cretaceous. The above scenario is of course very wild and not without a lot of speculation. But I believe it accounts for the strange anatomy of long necked plesiosaurs. As a mental exercise consider snakes that kill by constriction. If snakes were extinct today imagine the dilemma in reconstructing the feeding ecology of constrictors. Losing limbs imposes a lot of constraints on snakes, not the least of which is relatively slow movement. Why would a group of animals embark on this evolutionary course? Because the evolutionary advantage outweigh the disadvantages. I also want to stipulate that this feeding strategy is part of a larger generalist strategy many of these animals employed. 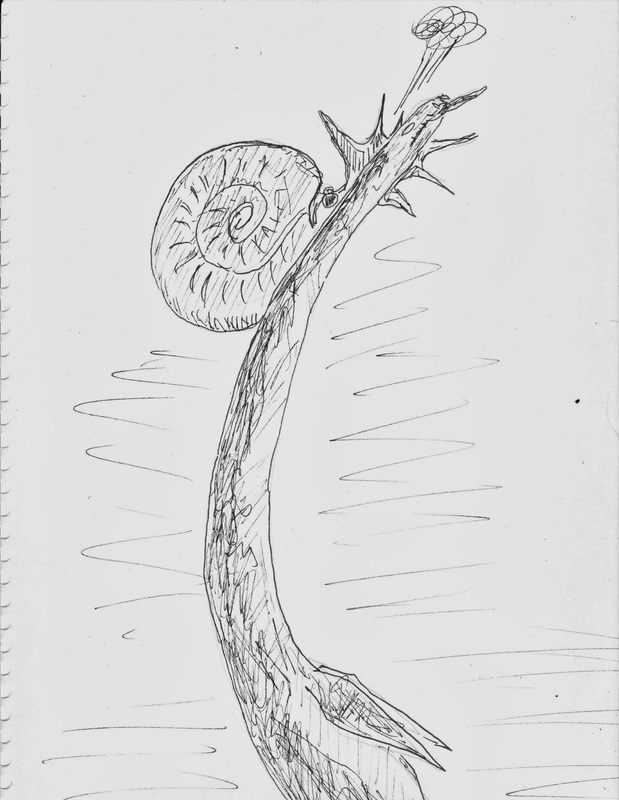 But I do think ammonites were the prime driver and after the neck evolved it was useful for other things as well. I made some quick 5 minute sketches to hopefully allow you to visualize what I think was going on. Not done for artistry or even accuracy, just to help the concept. Would also love comments , feedback, criticism. Step 3. Keep spinning until dinner is served!! All artwork Duane Nash. use with attribution for free. Neat idea, but I really don't get how the long neck transmits that kind of torque. If anything, wouldn't it dislocate a plesiosaur neck to have a big body spinning one end and a struggling large shell on the other, with a relatively thin neck in between? Thanks for comments. With the torque issue it needs of course some real biomechanical work on it- but if you look at the whole action as an interconnected chain the weakest link is what will break- the soft bodied cephalopod- with either a tentacle being wrenched off or the whole body yanked out as they did not live in the whole coiled shell just the outer part. Swallowing mushy cephalopods should not be a problem and since we know next to nothing about ammonite soft body anatomy whether or not they had suckers, tentacles, hooks is up for debate. Also probable in my opinion is that long necked plesiosaurs had strong contractile esophageal muscles. Humans can be upside down yet the muscles can still push food against gravity into the stomach. I would expect plesiosaurs to be under some bit of selective pressure to have good esophageal muscles but alas that stuff does not fossilize... As for fish there does appear to be a size constraint on what they would swallow because of all the bones in fish risk of choking etc. Squishy inverts, no such dilemma. As for the choking hazard, you might want to read up on Sannakji. It doesn't often kill people, but it does happen. Another objection, we DO have fossilized long-necked plesiosaur stomach contents, and it consists of small sqid pens, fishes, and the occasional swallowed pterosaur. The theory fails to contend with that. During the summer of 1903 the writer collected fossils in the Niobrara shales in South Dakota, finding the remains of many plesiosaurs. In nearly every instance a large number of siliceous stones were found associated with the bones, often embedded in the matrix en masse. In one specimen in which the largest dorsal vertebræ were four inches in diameter, there was at least half a bushel of these stomach stones, ranging from the size of a walnut to four inches across. Considering the weight of these stones, the wonder is that so many specimens contain them. One would expect that when the flesh began to decompose, the weight of these stones would be too great to be contained by the weakened tissues and that they would be lost before the animal reached its final resting place. This may well explain the absence of stones in some cases. Throughout the Niobrara formation in Dakota baculites are very abundant while scaphites are rare, especially in the shales. I would not be certain that any of the baculites associated with the plesiosaur remains had been eaten by these animals but in plesiosaur specimen number 5803 of the American Museum collection I found a variety of fossils representing this animal's last meal. Great numbers of fish vertebræ were scattered among the bones, while there were several pterodactyl bones, broken in small sections. But of chief interest were seven scaphites, more or less broken, which had without question been eaten by this animal. One other specimen had scaphites associated with it. The conclusion seems evident that invertebrate animals formed a large part of the food of plesiosaurs and that, in default of crushing teeth, the breaking up of the food was effected by the aid of these stomach stones, the presence of which further implies a thick-walled, gizzard-like arrangement in the alimentary canal. I would like to know what size of pterosaur was being swallowed? Were they swallowed whole or dismembered into smaller bits? Small fish- less than a foot and a half - suggest a size constraint due to choking. But since we do not know about the soft anatomy of ammonites- did they have hooks, pens etc -if only fleshy parts were being removed from giant ones and swallowed we might miss their preservation.